BetStars is GLI accredited and licensed in Isle of Man. Visit BetStars Get Your Free Bets! Wager $/£/€5 at odds greater than 1:2 and get $/£/€20 in four installments over 21 days. First installment within 72 hours. Are you an avid follower of different sports and would like to make things a little more interesting? Whether you can predict the winning team of an upcoming big football match, or the score of a basketball game, or who will win the next Gran Slam tennis tournament, BetStars has ensured to cover all the basics for you! BetStars is a betting brand under PokerStars, which also offers an online casino. All of these different brands can be accessed with the same account, which is of significant advantage to players that enjoy a diverse selection of online playing options. As such, you can easily navigate from BetStars' online sports book, to their casino lobby, and then to their interactive poker rooms. PokerStars is currently licensed in Malta and is a member of the Interactive Gaming Council, so players are guaranteed fair game play when placing bets at BetStars. At betstars.eu, players can place bets on tens of sports and events around the world with their user friendly sports betting online service, where you can even find betting odds and tips for random events such as the Eurovision. In addition, players have the ability to place bets on sports in practically every country - if people follow it, then they can also bet on it! If you have never had the opportunity to try sports betting online, or have never visited such betting websites, this review will help you in making it easier. It is actually a very simple and straightforward process, in which you place your stake on whether you think an outcome will happen or not. BetStars offers the latest odds and tips to aid players in this, so that they can win real cash prizes. BetStars is currently available in several countries, including Canada, and it is expected that the site will be rolled out in more jurisdictions during the coming months, with there already being betstars.com and betstars.eu in place. 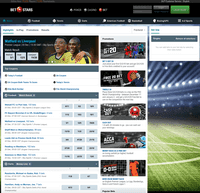 You can play on the BetStars sportsbook directly from your web browser. A software download is also available for desktop or mobile devices, and registered players can use both options to transition seamlessly from the sports betting section to other gaming services on BetStars using a single wallet. Getting started at BetStars is extremely simple! 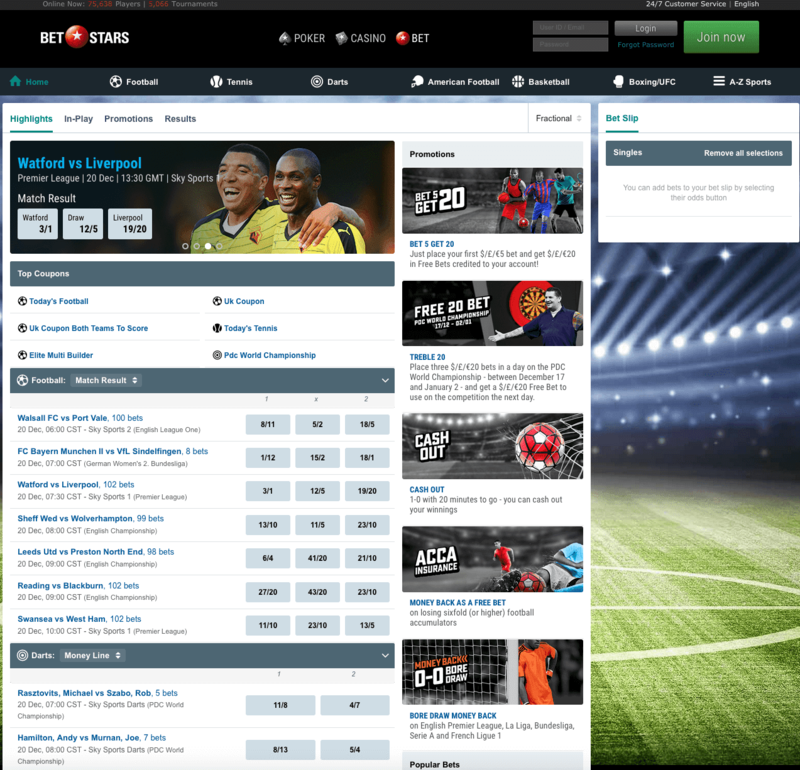 Simply register for a new account on betstars.com and visit the online BetStars sports book to place bets through the BetStars client or through your smartphone. If you already an experience player, you can place bets by using the current bankroll in your account, where you can even place wagers while waiting for the next poker tournament on PokerStars to start, increasing your chance of winning big real money prizes. Select your Event There is a wide range of sports and events to choose from the BetStars sports book. Once you're successfully logged into sports betting, choose the sport and/or event to see all available matches/selections that you can bet on. Pick your Market Next, select your desired match/selection to see all the markets offered, such as 'Match Result', 'Spread', 'Correct Score', 'Partial Score' and the related odds. It should be noted that different sports use different betting terms, so make sure you familiarize yourself with these! Set your Wager The next involves setting your wager, where you click on the odds of the desired bet to open your 'Bet Slip' on the right-hand side of the sports betting window. You can now enter your bet amount, and see how much your potential return will be. Place your Bet Lastly, all you need to do is just click 'Place Bet' to register your bet, after which a summary will be shown. Placed bets can also be tracked by clicking on the 'Open Bets' tab. Now just sit back and wait to see the final outcome of the sport match or event on which you have placed your bet! In addition, there are some sports and events that allow you to bet on them during the matches or performances. BetStars' 'In-Play' betting option will allow you to wager on these as they progress, which will make any sports and event even more thrilling to follow! You can also place bets through the BetStars App that is available for download on both iOS and Android devices. The key to being a winner at sports betting online is to know how sports book odds work. No betting website makes it easier than betstars.uk, where regularly updated odds provided in fractional, decimal and American formats. You can choose any of these formats from your account, but we suggest that you stick with decimal odds as they are the most straightforward. As an example, if are betting on football for Team A to beat Team B 1-0 at odds of 7.50, every €1 that you bet on Team A will provide a real money return of €7.50! In addition, you can also win real cash prizes when betting on the loser in some cases, so make sure you read all the BetStars tips before place your stake. 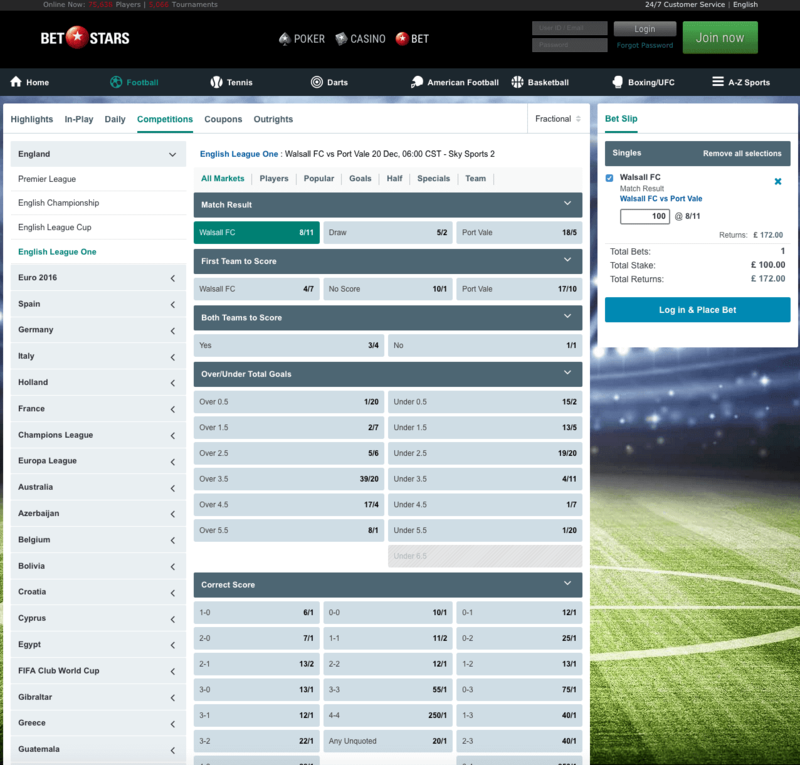 There are several types of bets that you can place from the BetStars sports book, which are all listed on the website. The most common types that you may come across are single bet, multiple bets and accumulator. Single bets is the simplest type, where you bet on one selection in an event, while multiple bets are wagers made on two or more individual events. Accumulator bets involve different selections in a single bet, such as match winners in different sport matches. Making deposits at BetStars could not be any more convenient with options for both desktop and mobile devices. When depositing money using desktop, there are different options available depending on the country from which you are placing your bet. Generally, there is a minimum deposit that is required unless stated otherwise (e.g. €10/$10). In order to deposit money, open the desktop poker client from your PC, log in and click on the 'Cashier' button to make your transaction using a wide range of methods. Among the deposit methods available, players can use renowned credit and debit cards such as Visa and MasterCard, popular electronic money transfer systems such as Skrill, Neteller, and Entropay, as well as local bank transfer. Players can also make deposits on the go through the apps on their smartphone or tablet, where they can fund their accounts and manage their bankroll using the Mobile Cashier. When it comes to withdrawals, most of the methods mentioned above are also available, but it is suggested that players check the BetStars website before selecting an option to see if this meets their expectations. In certain cases, withdrawals can also be made by checks, depending on the country in which the account is registered. BetStars assures its customers complete security and safety when managing their payments. It offers secure account segregation, where players' funds and account balances are held in separate accounts on BetStars that are managed by a leading European Bank. This ensures that BetStars will fulfil its monetary obligations towards its online customers at all times. Furthermore, players can set their own deposit limits when sports betting online. At BetStars, you can restrict your own weekly real money deposit limits that cannot exceed limits that have already been preset by BetStars. Customers can be rest assured that that real cash payouts will be quickly and easily cashed out, so that they enjoy the winnings they made. Bore Draw Money back - this offers allows players to get money back on 0-0 games of Europe's biggest football leagues, including the English Premier League, Italian Serie A, Spanish La Liga, German Bundesliga and French Ligue 1. BetStars will refund any bets of up to £/$/€50 on any 'Correct Score', 'Halftime-Fulltime', 'First Goalscorer', 'Last Goalscorer', 'Match Result', and 'Both Teams to Score', if the match ends at a score of 0-0! Tennis Sports Betting Bad Beat Accumulator - if you are an avid tennis fan, then this one is for you! BetStars is offering a refund on losing sixfold (or higher) accumulators. To qualify for this offer, the loss must be by just one leg and all sections in the accumulator must have odds that are greater than 1.2. Bad Beat Accumulator for football - There is nothing more unnerving than a last minute goal in a football match that offsets your carefully planned football accumulator bet. BetStars hates seeing good work go to waste, so it is offering a refund on losing sixfold (or higher) accumulators. To qualify for this offer, the loss must be by just one leg and all sections in the accumulator must have odds that are greater than 1.2. Sports betting online could not be easier with BetStars' mobile Apps for Apple and Android devices! Players can place their bets on smartphones and devices from anywhere and at any time. Markets Offered:American Football; Aussie Rules; Badminton; Baseball; Basketball; Boxing / UFC; Cricket; Darts; Esports; F1; Floorball; Football (soccer); Futsal; Golf; Horse Racing; Ice Hockey; Rugby Union; Rugby League; Snooker; Tennis; Volleyball.